Volkmann VS and PPC Series Vacuum Conveyors can be adapted with minor modifications to transfer liquids. 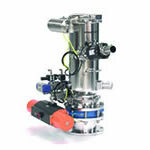 A float valve is used to protect the Vacuum Conveyor and its pump from overfilling. You can also use our Liquid Vacuum Conveyors for the easy and reliable suction and disposal of oil, emulsion and grease substances. Our units can filter the liquids and bring the liquid substances directly into collector tanks, bags, barrels and production machines. Suction cutting/machining liquids (such as oil and emulsion) directly from bottom-collector plates below production machines using an integrated filter for 100% liquid re-cycling. Aspiration and recycling of test fuels on engine test stands. Aspiration of oil, gas and kerosene from floors inside production and maintenance areas. You can also suction such substances from water-surfaces in the case of accidental spillage. Cleaning, suction, and collection of greases during the maintenance of bearing elements.